Is there a better alternative to AlgeWorksheets? Is AlgeWorksheets really the best app in Mathematics category? Will AlgeWorksheets work good on macOS 10.13.4? AlgeWorksheets needs a review. Be the first to review this app and get the discussion started! AlgeWorksheets needs a rating. Be the first to rate this app and get the discussion started! AlgeWorksheets... 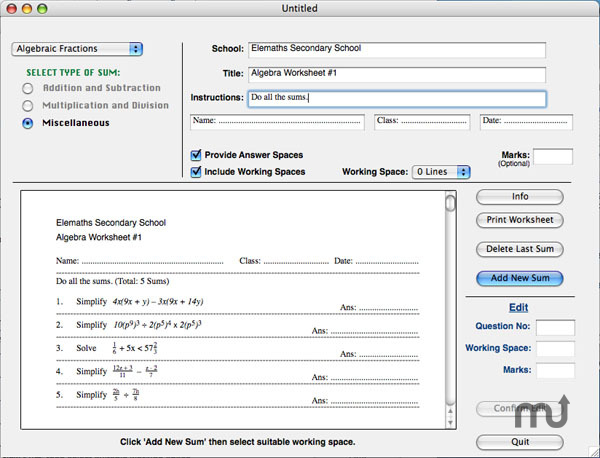 Generate and print pre-algebra and algebra worksheets or test papers in minutes. The sums may be from any one or combination of the following topics: pre-algebra (integers), algebraic expressions, algebraic expansion (multiplication of binomials and trinomials), algebraic factors, algebraic fractions, indices, inequalities, simple equations, simultaneous equations, quadratic equations, Fractions, Decimals, Significant Figures, Standard Form, Whole Numbers, Ratio, Proportion, Percentages, Angle Properties of Polygons, word problems on Equations, Rate, Ratio, Proportion, Percentages, Perimeter, Area, Cubes and Cuboids, Prisms, Cylinders, Pyramids, Cones, Spheres, Pythagoras' Theorem, Trigonometrical ratios. Every worksheet or test paper created will be original and no sums will be repeated within a worksheet. The amount of working space and marks allocated can be customised individually for every sum. An answer key will be printed after the worksheet.